A 2CD set. 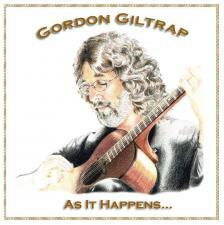 This is the first ever album to feature a complete and unedited Gordon Giltrap concert. It's all here - every note he played on the night, plus all the trademark chat. In January 2007 his concert at Dorchester Arts Centre was recorded for this live double album. This landmark release celebrates the ample skills and charms of one of our national treasures, a man who has indeed earned the respect of fans and fellow musicians alike. "Acoustic readers will be aware that Gordon Giltrap is one of the UK's most respected guitarists, and this double live album provides an excellent overview of his talents. Recorded this year in front of a typical village hall audience, it's the first album ever to feature a complete and unedited Giltrap concert, exactly as it happened on the night. The warts-and-all content brings the listener closer to the experience of a live performance and gives a valuable insight into the demands placed on a gigging musician. With no studio trickery to hide behind, this is an honest account of a good night's work by a veteran trouper. In addition to his trusty Fylde and Rob Armstrong guitars, Giltrap plays his 'baby' guitar, his £20 'car boot' guitar and his electric guitar, and employs a variety of effects to keep it interesting. The set is typical of his recent stage shows, though there's not enough time for all the live favourites he has amassed during his 40-year career. Notable highlights include the flower power of 'Lucifer's Cage', the thundering pop brilliance of 'Heartsong', the trademark picking-and-strumming of 'A Dublin Day' and a stunning electric one-man-band version of 'The Dodo's Dream'. There's a sprinkling of covers that betray Giltrap's musical influences and tastes, and the whole performance is wrapped up with anecdotes and good humour. A great night out in the comfort of your own home." Originally released on Panacy Records PANACD001 Oct 2007.